Shoe from reign of Charles II., 17th century. Home » Shoe from reign of Charles II., 17th century. Shoe from reign of Charles II., 17th century baroque period. 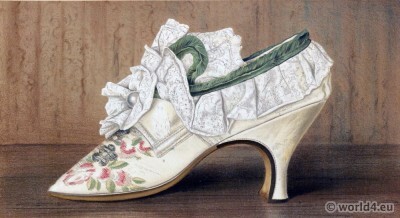 MISS LANGLEY, to whom this shoe belonged, lived in the reign of Charles II., (1630–1685). Made of pale silk, most beautifully embroidered, the shoe may be considered as a chef-d’oeuvre in shoe manufacture of the times; while the lace, of an intricate pattern and delicate as a spider’s web, is very old and of much value. It is ornamented on the instep by a single pearl, its tout-ensemble is altogether pretty and graceful, and says much for the taste and dexterity of the shoemakers in the days of Charles II. Recommended movie: The Libertine; Drama about the life of British free spirit and writer John Wilmot, 2nd Earl of Rochester, directed by Laurence Dunmore. With John Malkovich as Charles II. and Johnny Depp as John Wilmot. This entry was posted in 17th Century, Baroque, England, Nobility, Shoes and tagged Baroque fashion on 8/23/14 by world4.